Quote Reply Topic: KEMP LAND stamps. 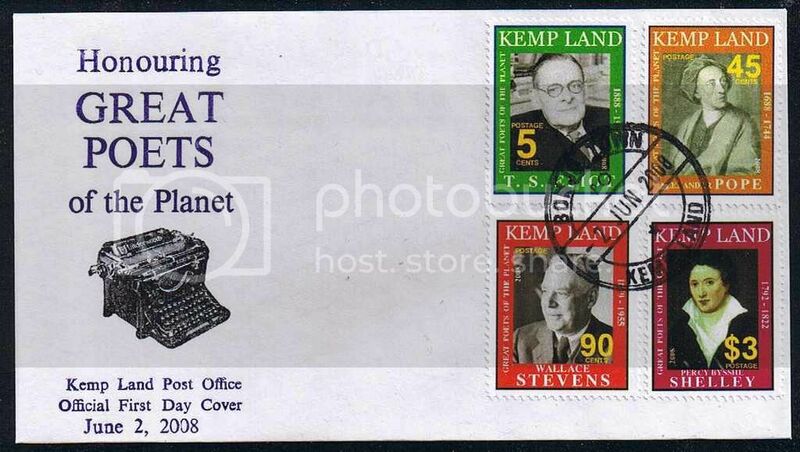 Kemp Land 2008 Great Poets of the planet set on First Day Cover. 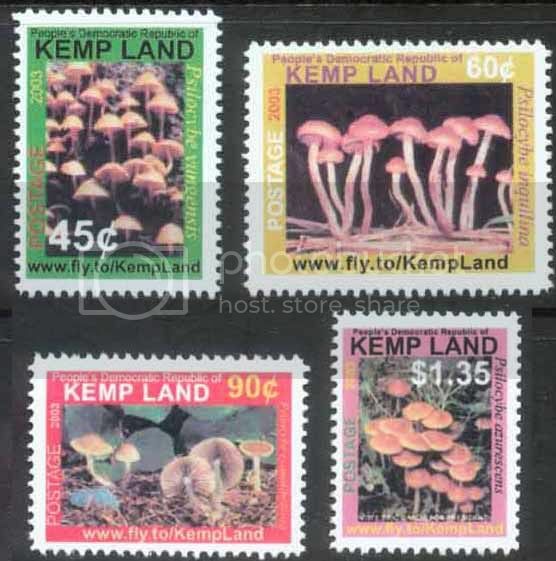 Kemp Land 2003 Magic Mushrooms set. On the frigid continent of Antarctica lies an astonishing land: thousands of people living and working in what many claim is the world's most daring social experiment. This is the People's Democratic Republic of Kemp Land, which proclaimed independence from Australia on 2nd October 1975. Kemp Land is a benvolent but low-tech dictatorship, led by the Democratic People's Party, and the Great Leader, Eric Gardo. The capital is Bonjo Town. Currency: 100 cents = 1 dollar. Kemp Land 2007 Old Steam Trains of Antarctica set. Kemp Land, once a part of the Australian Antarctic Territory before achieving independence, apparently still runs nice steam trains, and they showed some views of these on this attractive 2007 set. It is titled "Old steam trains of Antarctica". 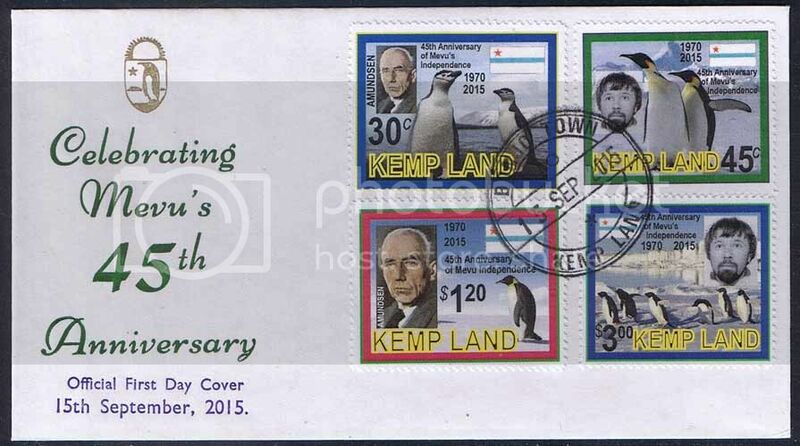 My favorite is the 90c stamp, where a small shunting engine has a few nearby penguins included in the photo. Wonder if they moved closer for the warm steam gusts? Kemp Land 2006 Roses set. This set is my favorite and is still used in Kemp Land as the definitive issue. Apparently, roses and other plants are grown in giant glass domes on the chilly plains of Antarctica. Sadly the web-site shown on the stamps is now defunct. 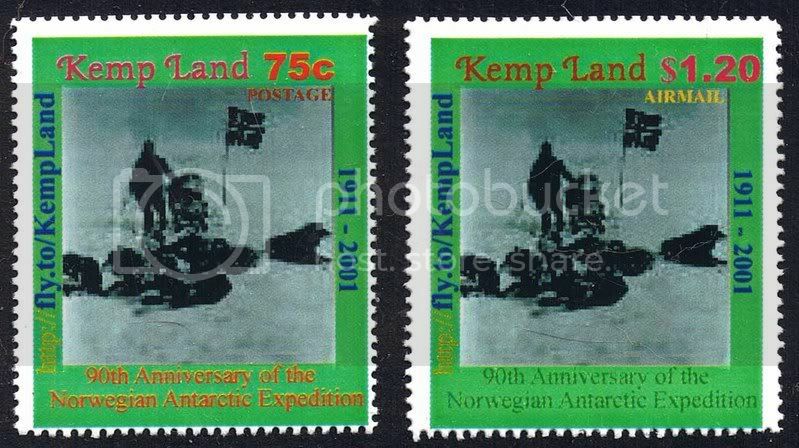 Kemp Land 2001 90th anniversary of Amundsen reaching the South Pole set. 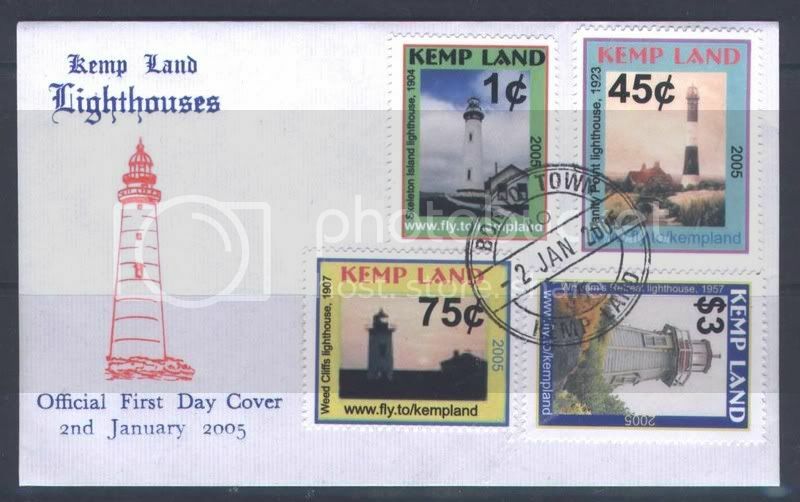 Kemp Land 2005 Lighthouses of Antarctica set on FDC. 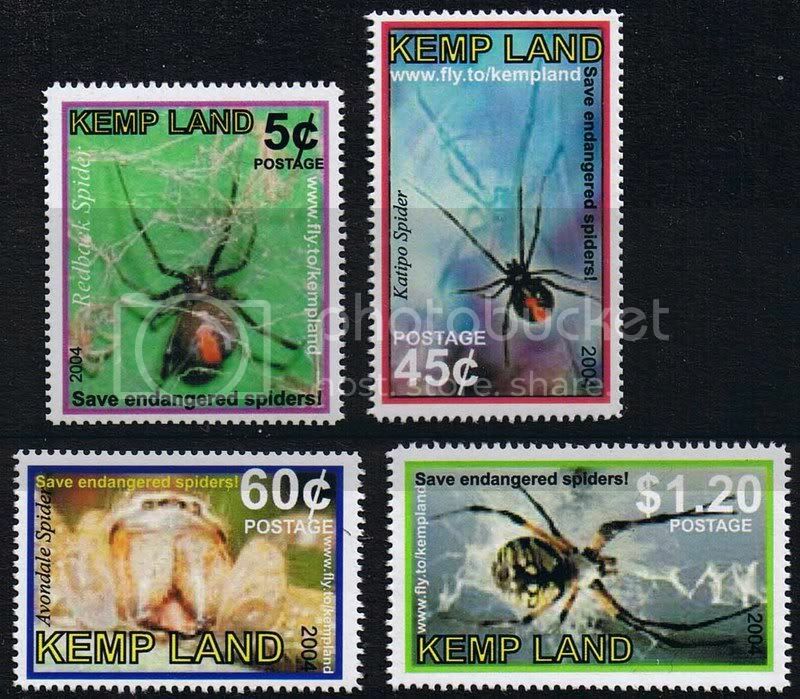 Kemp Land 2004 Endangered Spiders of Antarctica set. Kemp Land was the brainchild of an Australian philatelist and artist, Matthew Campbell. His early designs were cartoon-drawn by him, then sent to his Norwegian friend, Geir Sor-Reime (who produced stamps for Mevu and assorted other Antarctic states by photocopier), and Geir then photocopied Matthew's designs in black on to coloured paper, alongside his own. All were imperf. In 1988, Matthew asked Bruce Henderson to begin printing his stamps. By this time, Bruce was running several letterpress machines and had a nice perforator, hotfoil machine, and lots of fonts of type, and Matthew hoped his issues could be upgraded beyond the imperf xeroxing. So typography became the way forward for Kemp Land. Matthew continued to do the cartoon drawings for the stamps, while Bruce would re-do the text in Times Roman font, and then make photo-polymer printing plates to print the stamps with. 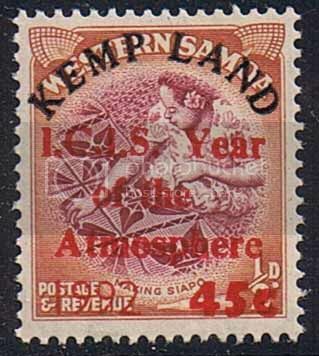 These were usually done at the same time as those issues of his own country, Occussi-Ambeno (so that the colour schemes used for Kemp Land stamps are identical with the Occussi-Ambeno issue of similar date.) Bruce also used his presses to print attractive first day covers, tourism posters, cards, and various self-adhesive stickers for Kemp Land. This continued up to 1999, when Bruce enrolled in a multimedia digital training course, and learned how to use Photoshop, vector graphics, and make websites. 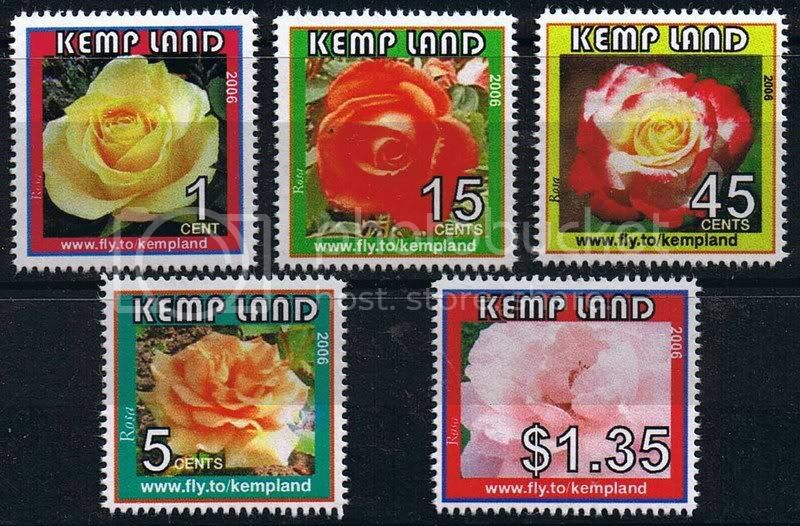 So from 2000 on, nearly all Kemp Land stamps have been full-colour using photographs, and the cartoons have ceased. However, Matthew still chooses the issues, as well as the illustrations to show on them. Kemp Land 1998 Great Philosophers of the planet set. 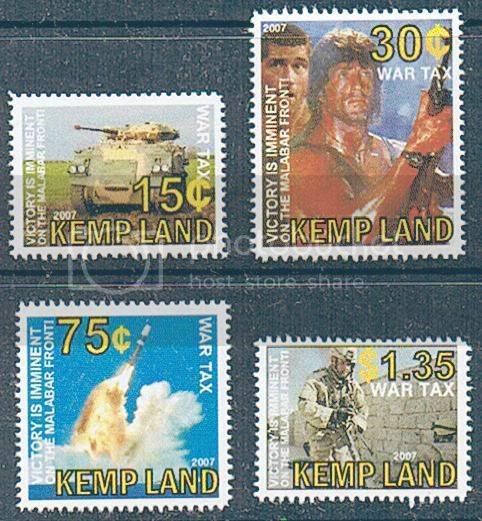 Kemp Land 2007 War Tax set. In 2015, as a result of anti-homosexual repression by the Gardo regime, a gay uprising quickly took over and Gardo was deposed. The new leader, Aubrey McKinnon, proclaimed the country the Gay Republic of Kemp Land. Matthew asked Bruce Henderson to overprint some older stamps. So four earlier issues were overprinted, with the amazing Adana 8x5 press. 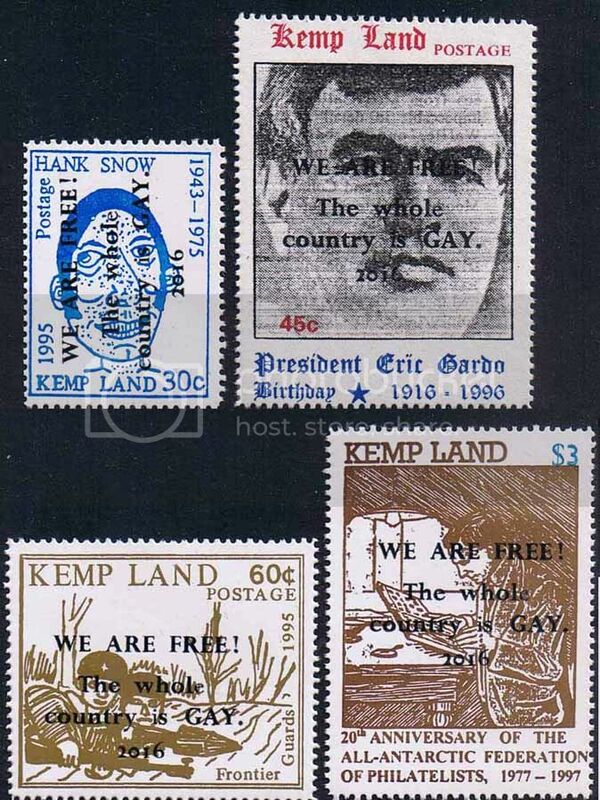 Kemp Land 2016 Gay Revolution overprints set. This set aroused derision on the Australian forum Stampboards. However, much of that could be due to Australian resentment of the fact that part of the former Australian Antarctic Territory had seceded from the Great Aussie Empire. 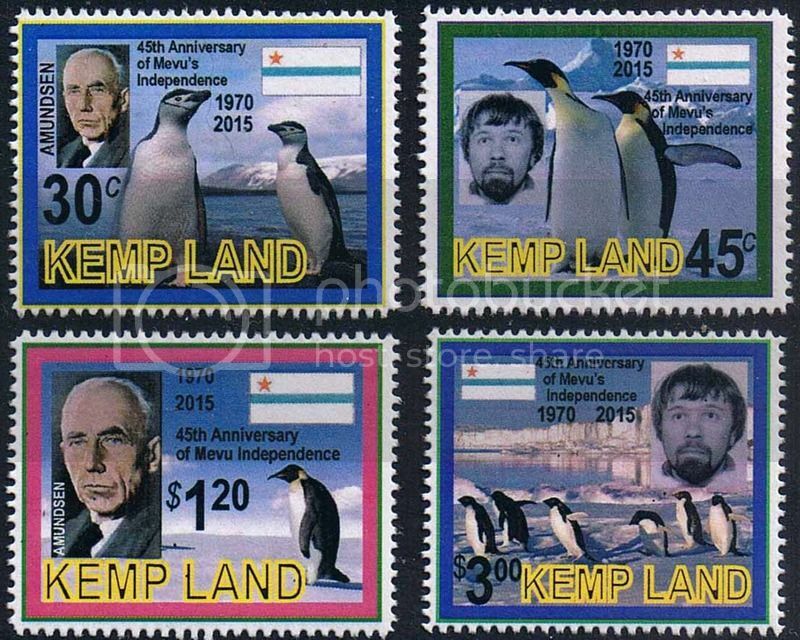 Let's look at more of Kemp Land's 40 years of stamp-issuing. Kemp Land 2009 Great Rock Bands of the planet. This set was prompted because Matthew was keen to see an American punk band "The Dead Boys" (1c stamp) shown on stamps. 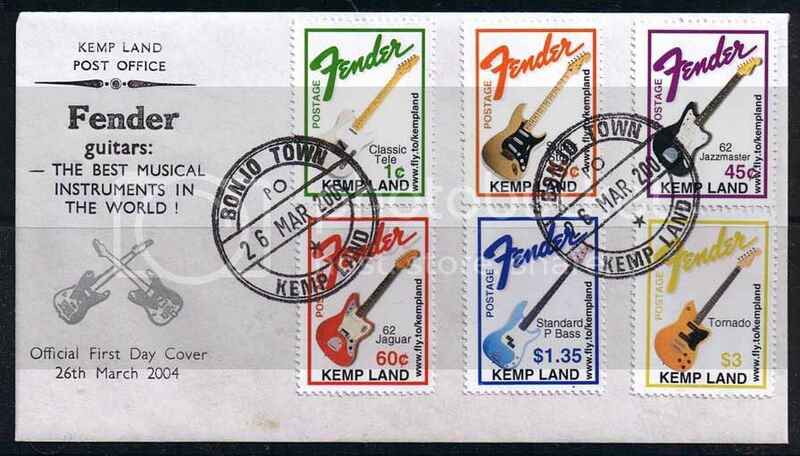 Bruce included another stamp showing a New Zealand band his friends played in ("Last Orders", 60c stamp) and the $3 shows USA band KISS, to give the set some marketability. 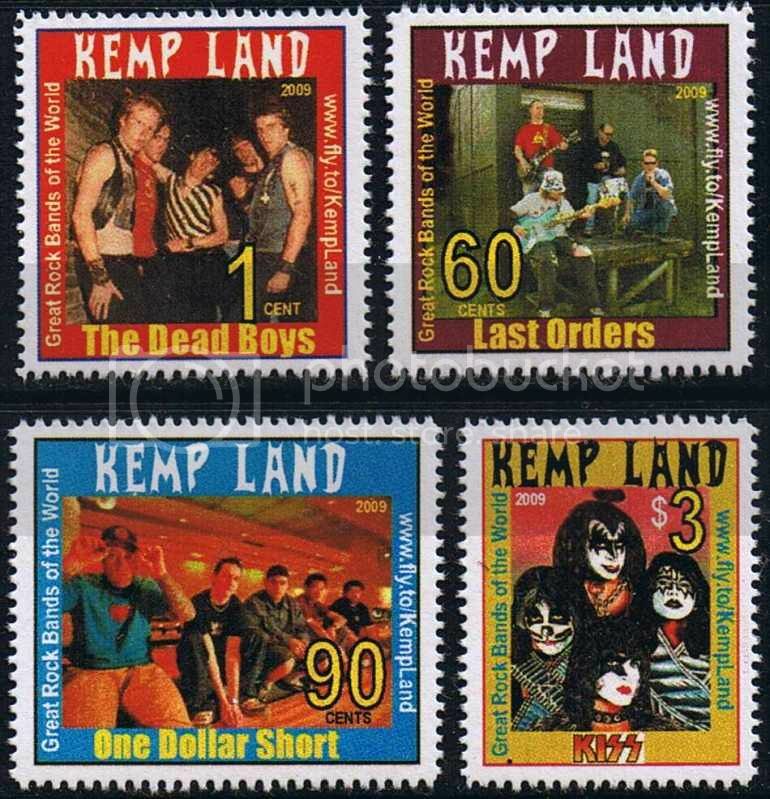 Lots of KISS fans have purchased the set: one of the few times Kemp Land stamps have been lucrative. Kemp Land 2015 45th anniversary of Mevu's independence. This set shows Matthew's old friend Geir Sor-Reime (who originally collaborated in printing Kemp Land's stamps) on two of the stamps. The Norwegian explorer Roald Amundsen is on the other two designs. The stamps were issued on 15th September 2015. Mevu is a Fifth World country located on the Riiser-Larsen Peninsula in Antarctica, and was founded by Geir Sor-Reime, an archaeologist from Norway. In 1971, as a busy student, he decided it was "too time-consuming" to continue, so handed it over to his old friend Bruce Henderson, who ran Occussi-Ambeno, the only other land to recognise Mevu up till then. Bruce did a few issues before Geir was inveigled into taking control again in 1973. For more on Mevu and photos of its stamps and covers, see the Mevu website. Kemp Land 2017 75th anniversary of the Wannsee Conference. This set shows the Norwegian Vidkun Quisling, as a favour to Matthew's old friend Geir Sor-Reime (who originally collaborated in printing Kemp Land's stamps) who likes Norwegian history on stamps. The other values show the organiser of the conference, Heydrich ($1.35 stamp), and imprisoned concentration camp slaves (5c stamp), with the villa it was held in being shown on the 60c. I agree with Ewan, but the set shown is very tasteless, celebrating an event that lead to the gassing and attempted destruction of the Jews? Gay Republic my foot, if he is trying to say this event was evil, this set proves the opposite - celebrating the Nazis and no comments on the suffering of the Jews. One reason I do not support Panterra more is his anti semitic Holocaust denying attitudes. Nothing will ever excuse or explain the insanity that ruled Germany in the 1933 - 1945 era. It is sadly about to be repeated now with another hyper racist and bigotted madman in control. Yes, I completely agree - when I looked at these bogus labels, I couldn't for the life of me figure out whether they were "for" or "against" the Wannsee Conference. They are a very tacky opportunistic way to make 100 or so bucks I say. Hours of artwork and production for such a small return. Flipping burgers at Maccas, even in NZ, must pay better? No-one seems to see the Big Picture here. Hitler (a Jew himself!) cleverly pretended to be "anti-Jewish" in order to provoke Jews to leave comfortable modern Europe, and move away to the dusty, sandy desert land of Palestine, in order to create the State of Israel. Without the pretended anti-Jewishness, Israel today would not exist. All the Jews would have stayed in Europe. This is all explained in the book "The Transfer Agreement: The Dramatic Story of the Pact Between the Third Reich and Jewish Palestine" by Edwin Black. Please get it from your local library for a fascinating read. "The Transfer Agreement: The Dramatic Story of the Pact Between the Third Reich and Jewish Palestine" by Edwin Black. First published to international acclaim in 1984, "The Transfer Agreement" stunned readers worldwide with its revelations of a pact between Zionist leaders & Hitler's Third Reich. Concluded in 1933, this controversial pact transferred 55,000 Jews and $100 million to Palestine on the condition that Zionist organizations call a halt to their economic boycott of Nazi Germany -- a potent tactic that was threatening to topple Hitler's government, then only in its first year in power. The debate over this controversial deal virtually tore apart the Jewish world in the pre-World War II era, & it remains unresolved today. Whereas the transfer agreement indeed ultimately saved lives, rescued assets, & helped lay the foundation for what would become the Jewish state in 1948, it also arguably allowed the Nazi regime to survive its first year &, over the next twelve, to plumb the depths of ethnic intolerance and implement massive genocide. With the world today confronting such morally complex issues as the compensation for slave labor during the Holocaust & the refusal of Swiss banks to return Jewish assets to their rightful heirs, the transfer agreement & the boycott that preceded it stand out as early examples of Jewish initiatives against Nazi terror. However ambiguous the choices made by the Jewish leaders in the turbulent prewar 1930s, they stand in a new and different light today. "The Transfer Agreement" is a remarkable & revelatory book that has now found its time. In this context, the Wannsee Conference was a milestone, and an important event in the history of Judaica and Europe generally. Matthew does not use the internet, so only saw these reviews of his new issue later. He was delighted by the controversy, especially by one lad suggesting they were "tasteless". 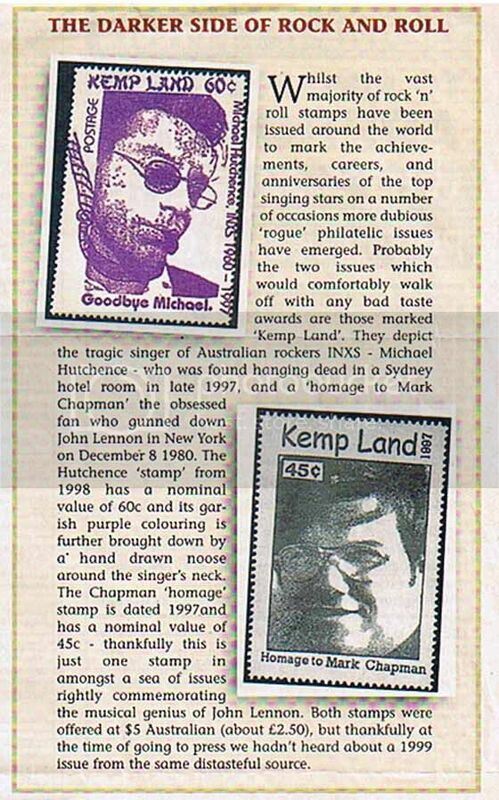 Kemp Land's previous big claim to fame was winning the Bad Taste Award from the UK's "Stamp Magazine" (December 1999, page 71) over it's Michael Hutchence and Mark Chapman stamps. Kemp Land 1993 ICIS Year of Fruit. A definitive set featuring quotations from the Great Leader, Eric Gardo, were designed by Matthew with text typeset by my IBM Composer, and these were printed and issued over the years between 1992 and 1996. The series was a homage to China's stamps featuring "quotations from Chairman Mao." This 90c stamp was printed letterpress with Heidelberg Platen press on white paper with invisible gum, perf 12. Date of issue of the original 90c (without overprint) was 5th November 1992, and some of the edition were later overprinted in gold ink, again using the Heidelberg press, to celebrate ICIS's Fruit Year. The date of issue of this incarnation was 16th March 1993. Kemp Land 1995 "Our Armed Forces". This set used cartoons by Matthew with text typeset by my IBM Composer, a truly wondrous typesetting machine that I bought in 1986. Letterpress printed with Adana 8x5 press on white gloss art paper, perf 12. Date of issue was 12th December 1995. 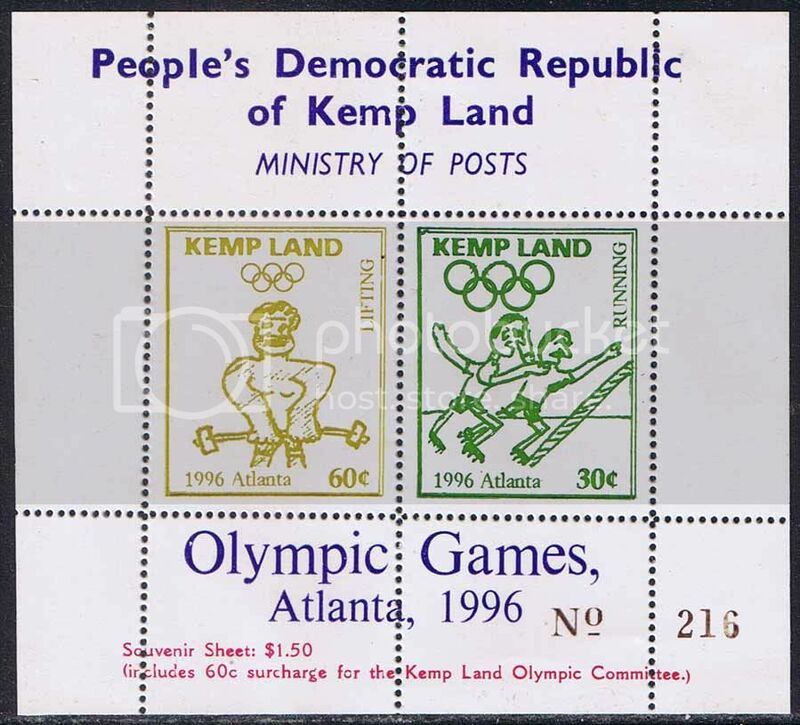 Kemp Land 1996 Atlanta Olympic Games, souvenir sheet. This set again used cartoons by Matthew with text typeset by computer. Letterpress printed with Adana 8x5 press on white gloss art paper, perf 12. Kemp Land 1997 Mark Chapman set. To create this set, Matthew sent Bruce a magazine photo of Mark Chapman, so Bruce added the text using computer, and made a polymer plate. Letterpress printed with Adana 8x5 press on white gloss art paper, perf 12. There were three different colour versions, all issued at the same time, on 18th June 1997. 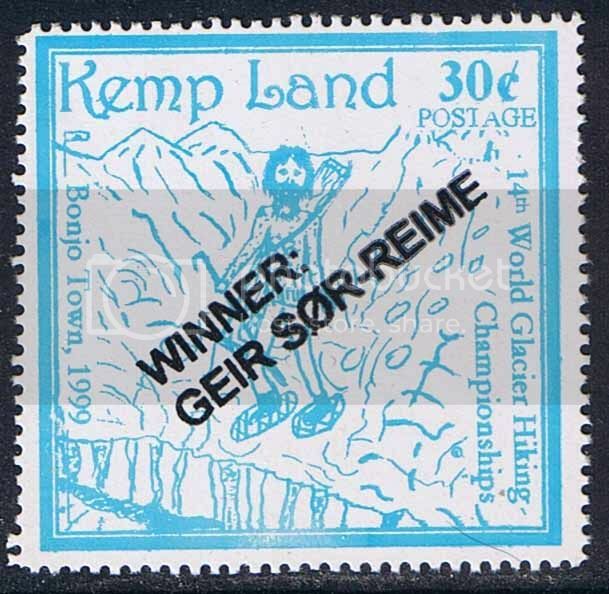 Kemp Land 1999 Glacier-hiking, Geir the winner. This stamp again uses a cartoon by Matthew with text typeset by computer. The cartoon shows his friend Geir hiking over a glacier. The "Geir the winner" overprint is a homage to the UK 1966 World Cup "England Winners" overprint. Letterpress printed with Adana 8x5 press on white gloss art paper, perf 12. I had to make a separate plate for the overprint, since the "O" with a slash through it in Geir's surname is not a character found in English metal type fonts. Unoverprinted stamps were issued on 8th May 1999, with the overprint appearing on Prizegiving Day, 23rd May 1999. 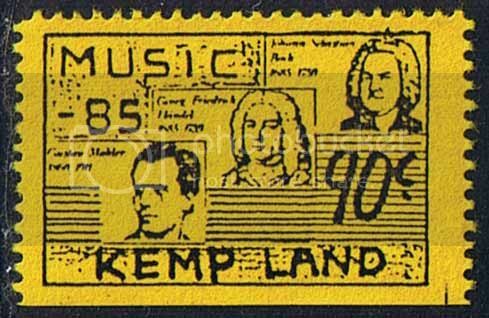 Kemp Land 1985 Music Year. This stamp used a cartoon by Geir. He did similar designs for his other lands, which were issued imperf. Photocopied in Norway on toned paper, and later perforated 12 by Bruce in New Zealand. Imperf stamps were issued also. Issue date was 19th August 1985. 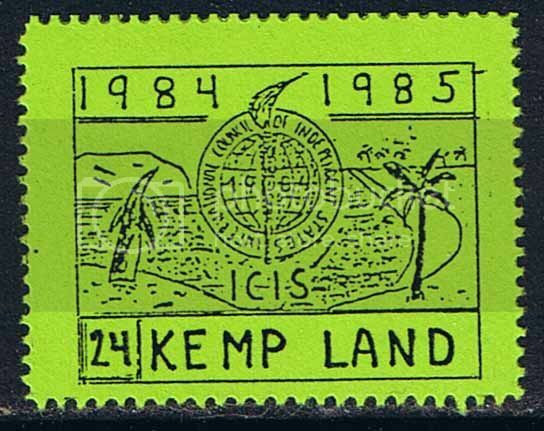 Kemp Land 1985 First anniversary of the International Council of Independent States. 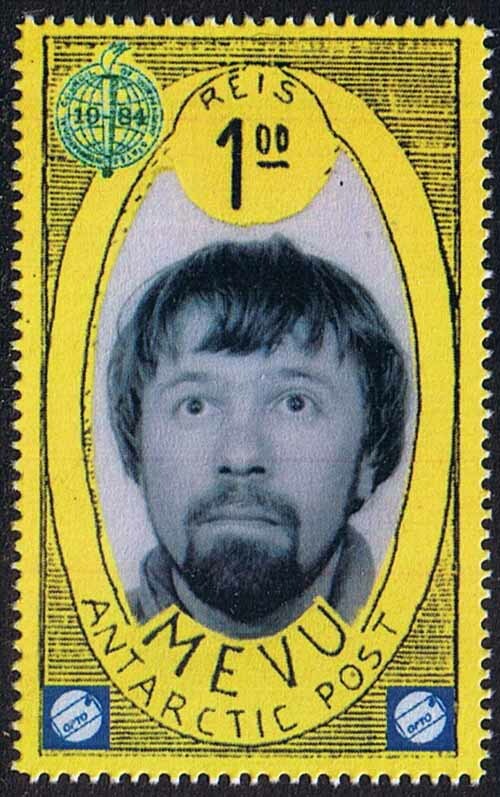 This stamp again used a cartoon by Geir. He did similar designs for his other lands, which were issued imperf. Photocopied in Norway on toned paper, and later perforated 12 by Bruce in New Zealand. Imperf stamps were issued also. Issue date was 1st June 1985. 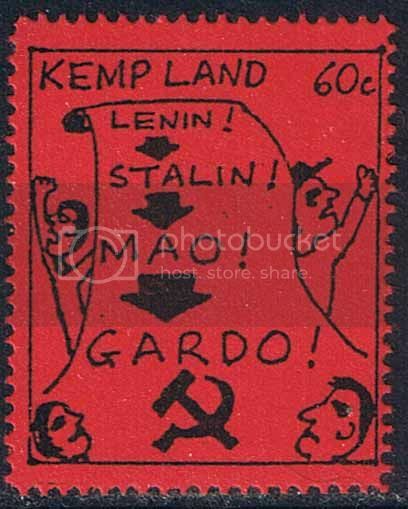 Kemp Land 1990 Lenin, Stalin, Mao, Gardo. This stamp used a cartoon by Matthew. He sent the artwork to Geir, who photocopied them in Norway on red paper, and returned them to Matthew in Australia. Matthew later forwarded them to Bruce who perforated them and they were issued on 17th December 1990. It is uncertain what year they were actually designed and photocopied, which may have been several years previous. Always good to see more stamps and the stories behind them. Will all the work you been involved with be appearing here. If so keep it steady, and not all at once. Give us a chance to savour them, and make it last longer. If so keep it steady, and not all at once. Give us a chance to savour them, and make it last longer. I like the cartoon or hand-drawn issues but the photo types are awful, especially with the website address which detracts immensely. I have to say though that I found the Princess Lumpilla stamp enormously funny and still get a kick out of it whenever I come across it. I think a return to the cartoon types would not go amiss ! Matthew would agree that the cartoon styles are best, but from my point of view as the printer, they involve much extra time: platemaking (expensive) then hand-printing (very time-consuming.) In contrast, I can design and print a colour photo set in one hour and at negligible cost. And since most of the "conventional states" do similar colour photo designs these days, as a "modern" country, Kemp Land likes to keep up! Kemp Land 1993 Academy of Arts & Sciences. 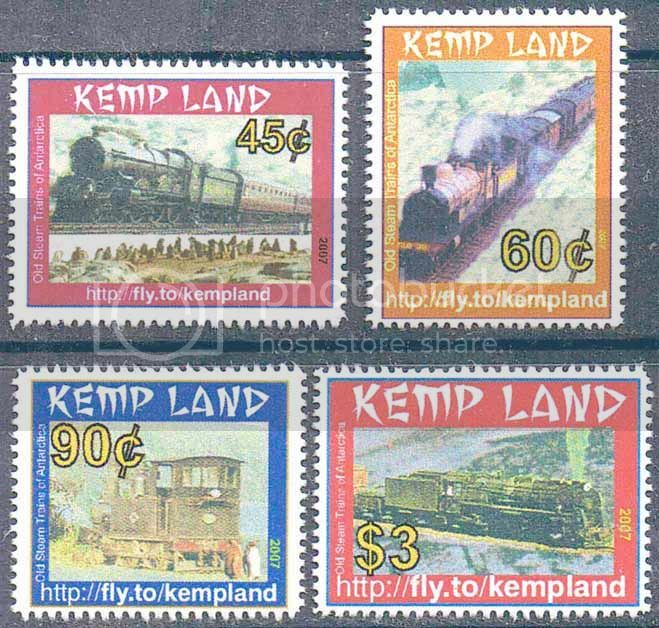 I've nearly finished Part 3 of the saga of Kemp Land stamps, so expect to see more details here soon! 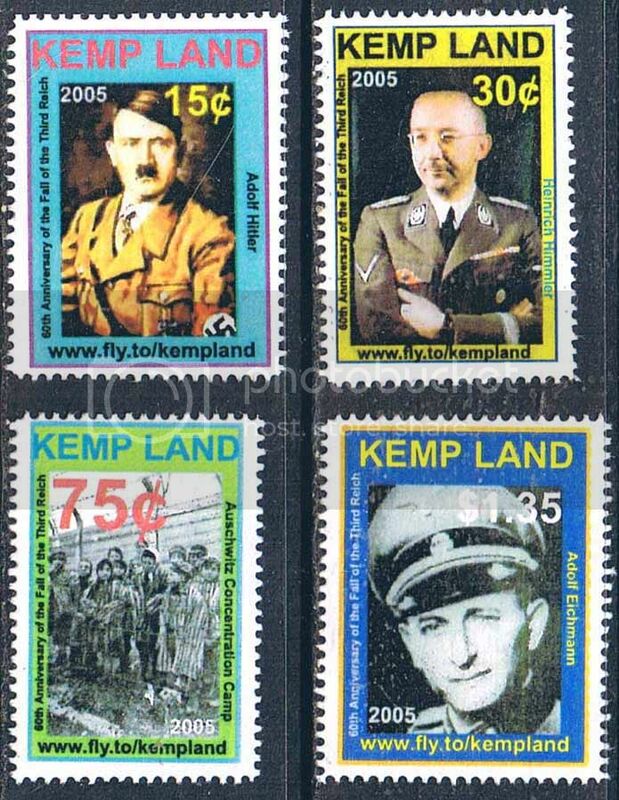 Let’s look at some more of Kemp Land’s amusing and controversial stamps. Kemp Land 2004 Guitars set. This set was designed by Graham Judd, a musician and guitarist himself. 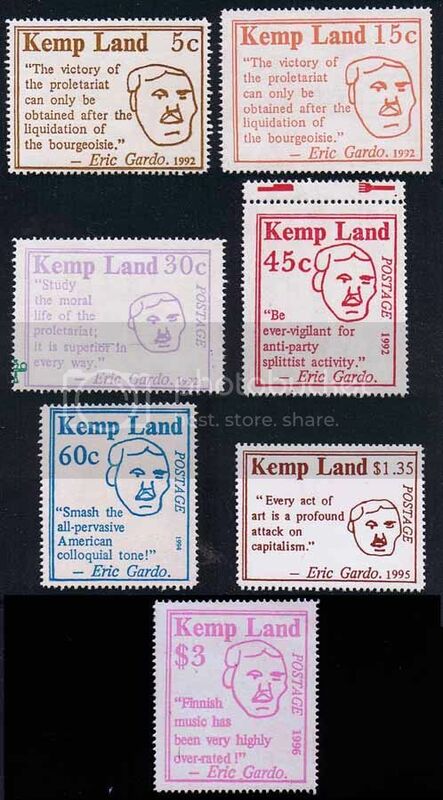 It is widely regarded as one of Kemp Land’s better stamp issues. 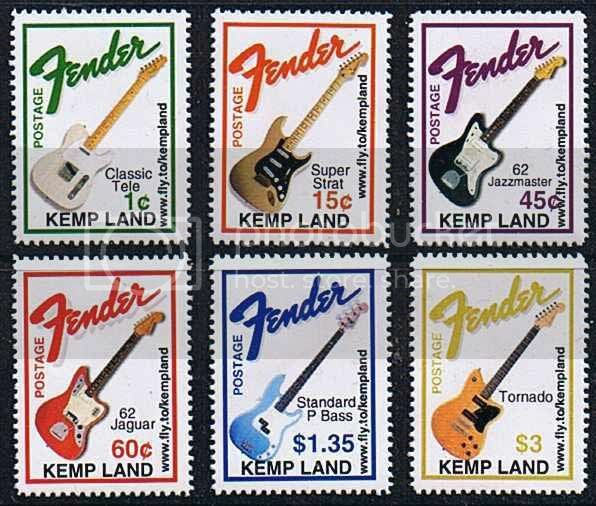 Kemp Land 2004 Guitars set, on first day cover. 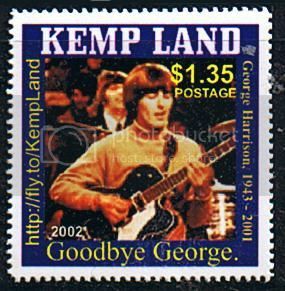 Kemp Land 2002 George Harrison (Beatles) farewell. Matthew specified a “Goodbye George” stamp, but left the design up to Bruce. 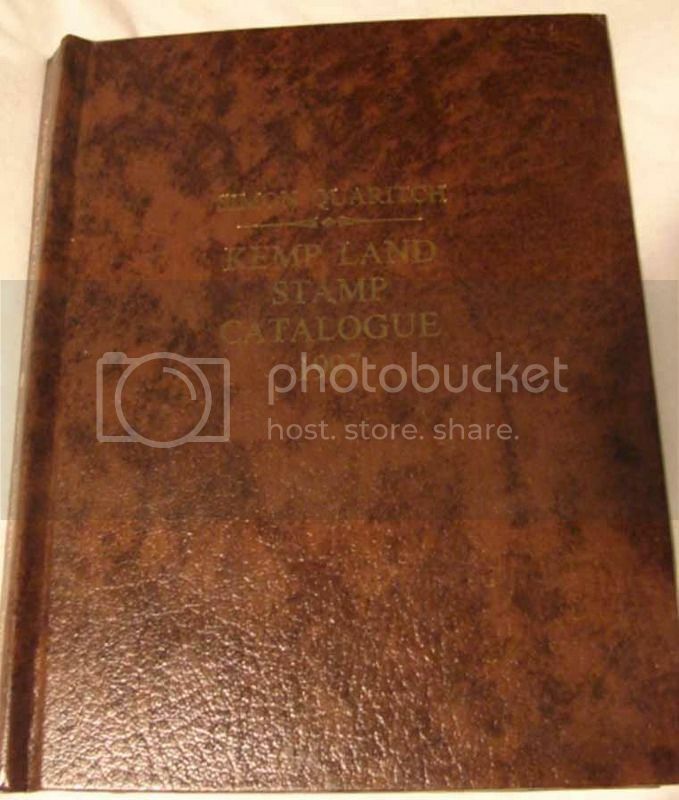 Yet another of Kemp Land’s more popular issues, with many sold on Ebay and Trademe, unlike most of Kemp Land’s “quirkier” issues, which seldom sell more than half a dozen. 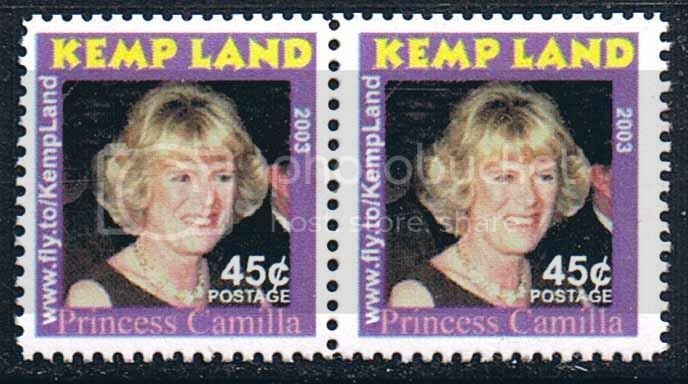 Kemp Land 2003 Princess Camilla. This stamp was considered very scandalous at the time, as Camilla was “that woman everyone knew the Prince was involved with”, but she was never mentioned in the conventional media (and only occasionally by the scandal rags.) An extra large print run was made, so that they could be used on the Kemp Land newsletters for many months. Kemp Land 2016 handwritten newsletter, number 2624. The Ministry of Propaganda is the main user of Kemp Land stamps. An irregular single-page newsletter, calligraphed by Matthew Campbell, is posted to a worldwide mailing list. (A cover containing one of these newsletters was shown earlier in this thread.) 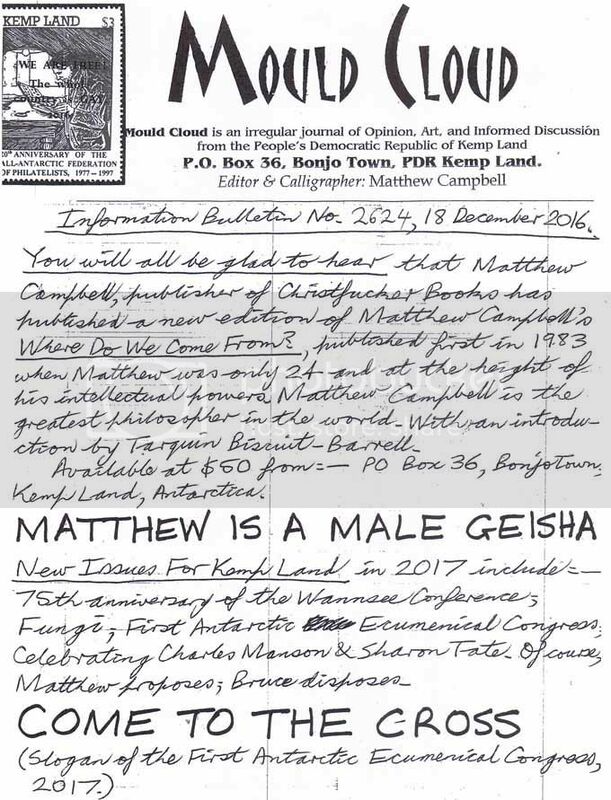 If you would like to join the mailing list and receive these paeans of wisdom, a request letter to the Kemp Land Information Service, 115-c Essex Street, Epping, NSW 2121, Australia, will get you enlisted. 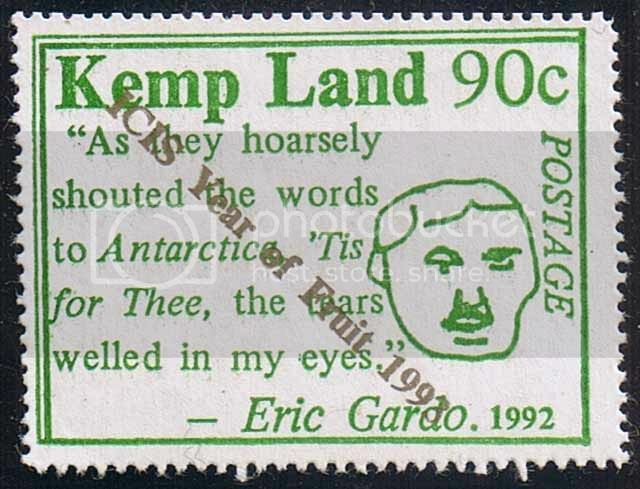 (Please include some mint and used stamps to sweeten the deal, and use pretty commemoratives on your envelope: after all, they are all philatelists in Kemp Land!) The same agency is also able to supply mint Kemp Land stamps and FDCs, and would be happy to barter for some of yours. The hand-calligraphed newsletter is a homage to a medieval French philosopher who regularly wrote missives to all the crowned heads of Europe. 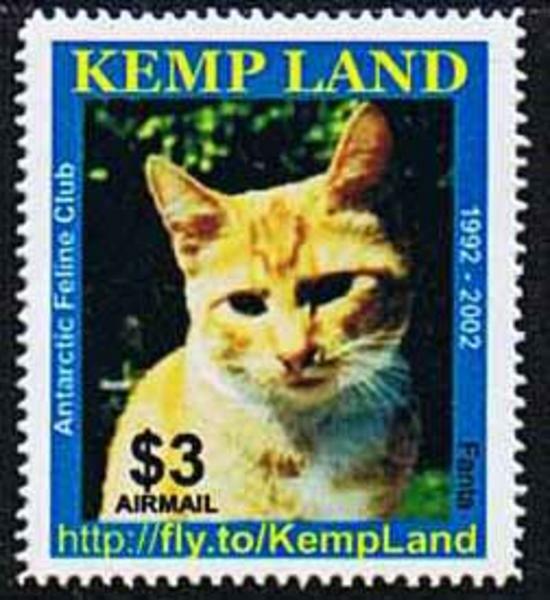 Kemp Land 2002 Ginger Cat. The Cats were a series of four (as is usual for most KL sets), and the top value, $3, shows Bruce's male cat Fanta, perched on his mailbox. Kemp Land 2005 60th anniversary of the fall of the Third Reich. The Third Reich series of four achieved notoriety for showing Mr Hitler on the postcard-rate stamp, and was prompted because Matthew and some of his friends collected Germany and sought a tie-in. Issued on 8th May 2005. 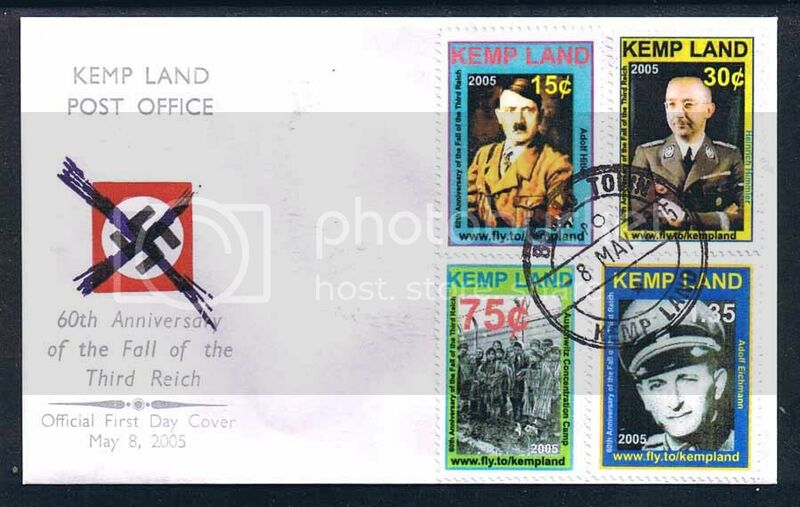 Kemp Land 2005 Third Reich set on first day cover. I got some funny looks from the platemaker when getting the plates made to print the Nazi logo on the envelope! 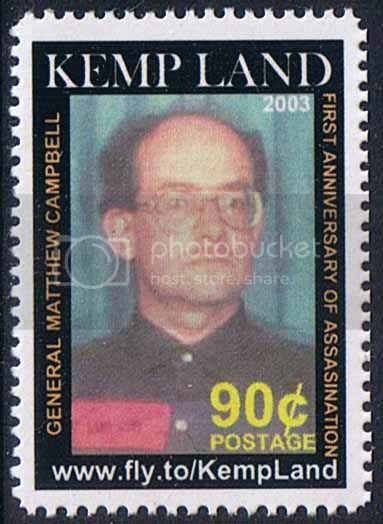 Kemp Land 2003 1st anniversary of the assassination of General Matthew Campbell. 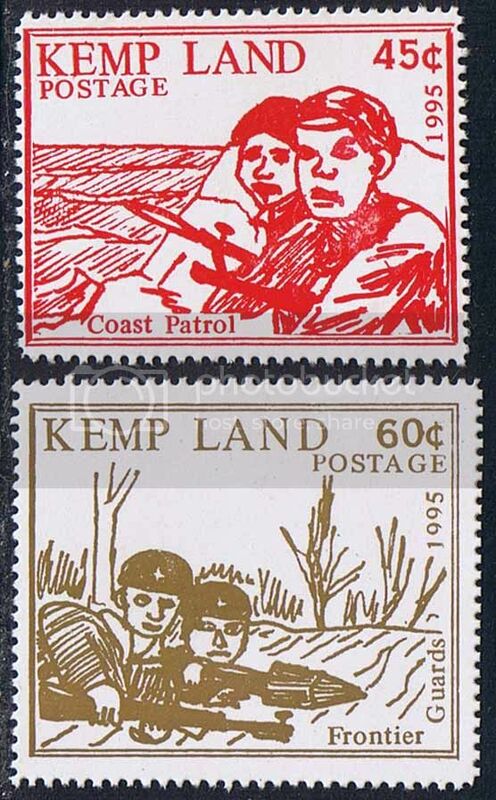 Matthew sent his photograph to be used for this stamp, wearing his Kemp Land Army uniform. This has a red satin ribbon emblazoned on the tunic, with the words KEMP LAND ARMY in black: printed on my Adana a year or so previously. I suggested to Matthew that he should always keep a few of this stamp in his wallet, just in case he happens to get run over by a bus or train. The gendarmes will then be most perplexed to find stamps celebrating the first anniversary of his death in his pocket! However, as I write, he remains in good health. Kemp Land 1996 Galaxy Master Battenberg visits Antarctic UFO Bases. SQ 101 – 103. This set of three was printed on white gloss art paper with Adana 8x5 press. The lettering was done with the trusty IBM Composer. The 45c is quite a vivid fluorescent pink colour, which looks a lot brighter than shown here. Issue date was 23rd June 1996. Kemp Land 1992 ICIS Year of the Atmosphere. SQ 86. This stamp was made by overprinting a Samoan 1952 ½d stamp. Matthew purchased a full sheet of this from a local dealer at a cheap price, and sent them to Bruce with instructions on how the overprint should be done. A plate was made for the semi-circular text, while metal type sufficed for the remaining text. Issue date was 10th July 1992. Kemp Land 1992-96 Thoughts of Chairman Eric. SQ 79 – 85. Kemp Land 1995 20th anniversary of the death of Hank Snow (patriot). SQ 94 – 97. 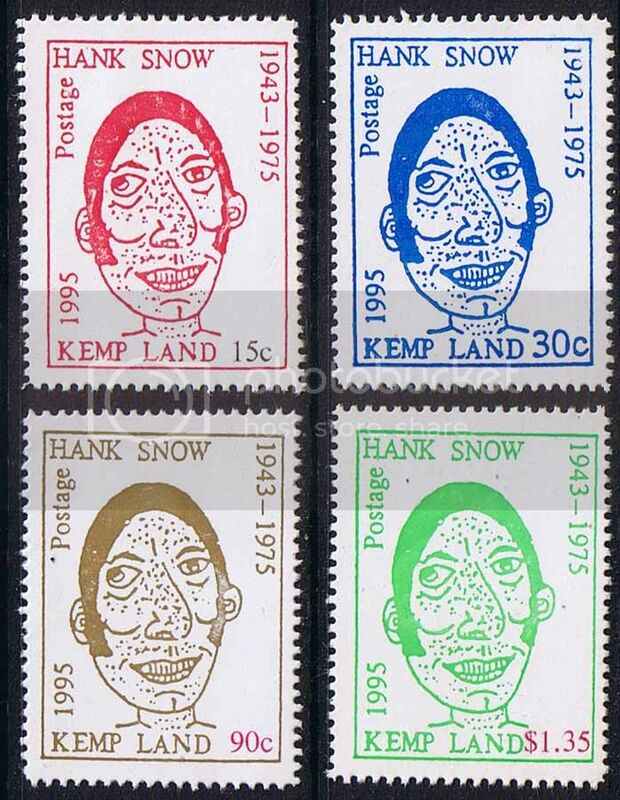 This set honours Hank Snow, a member of the Kemp Land Army who gave his life in the fight for freedom from the frumious Australians. Designed by Matthew, and printed on gloss white paper with Adana 8x5 press. Issue date was 4th November 1995. 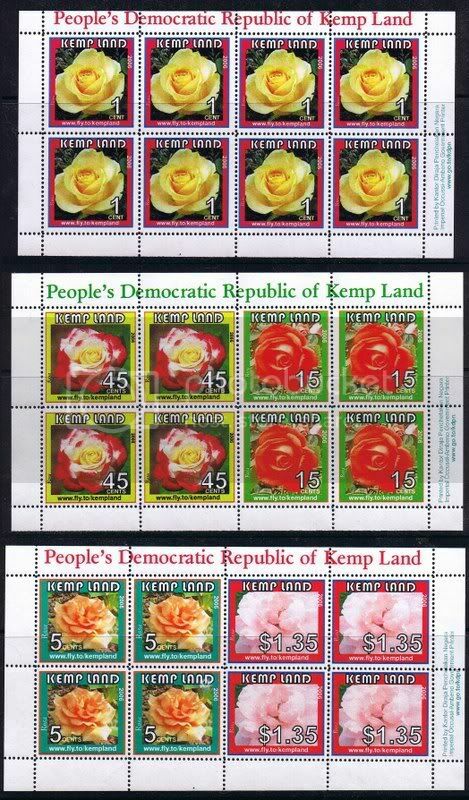 Kemp Land Stamp Catalogue 1997, by Simon Quaritch. 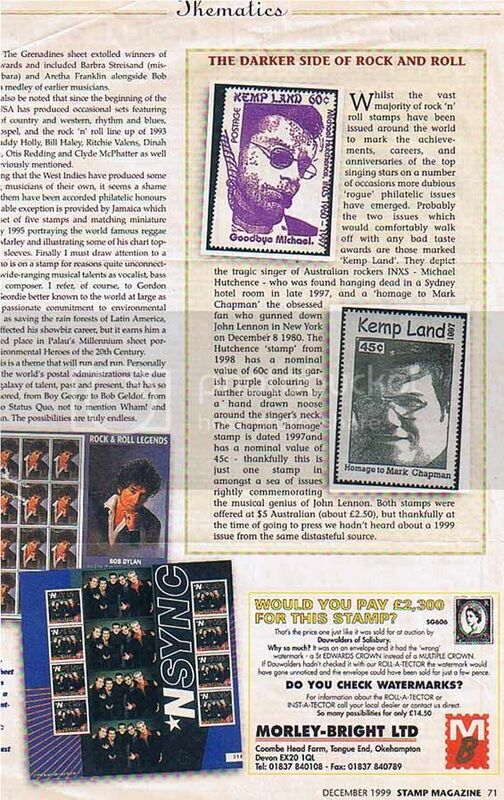 This hard-cover catalogue was published by Lancaster Publishing in 1997, and lists all the stamps of Kemp Land up to the Mark Chapman issue. It is now out of print, but a new update is in preparation. 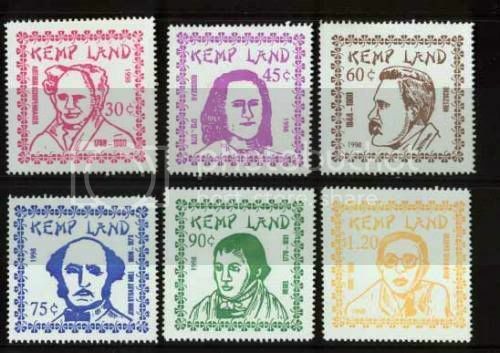 Stamps of Kemp Land are referred to by their “SQ” numbers, a homage to the “SG” numbers of the First World. The title on the front cover and spine are in shiny metallic gold, done by hot-foil. It is hard to photograph this without getting a mirror-type reflection, but we seem to have done it here. As a guitarist and owner or 2 Fenders (and 2 Warwick) basses, the Fender issue is a very interesting and appealing set.